This is another one of Starfighter Decals' event sheets and I am glad they do these. This particular one is for the Battle of the Coral Sea in May of 1942. There are a total of ten different markings options for this one. Kits by Hasegawa are recommended for the Wildcats and Dauntlesses while Airfix is suggested for the TBD. There are, of course, other kit makers who do these aircraft, but the decals are designed for those mentioned. All of the aircraft are in blue-grey over light gull grey and have the red and white rudder stripes that disappeared shortly after this engagement along with the red dots in the center of the insignia. First, the Wildcats. These are all F4F-3s and include aircraft from both VF-42 and VF-2. First is Ens McCluskey's plane from VF-42 followed by Ens Walter Haas' plane. From VF-2 is LCdr Paul Ramsey's plane that was previously flown by Butch O'Hare. For the Dauntless we have three from VS-2, all with the smaller insignia and one from VS-5 that carries the overside ones on the fuselage. An extra Dauntless is included from VS-2 with full codes. All of these planes are SBD-3 versions. Finally, a pair of TBD-1 Devastators. These were flown by VT-2 and VT-5. VT-5 did manage to get a couple of hits on the Shoho that helped to sink her. The instructions are quite comprehensive with all sorts of notes on each aircraft to ensure that you are able to get the most accurate representation. The decals themselves are superbly printed by Cartograf and you have enough common markings to do one of each type. The kit decals can help to allow more options to be built. 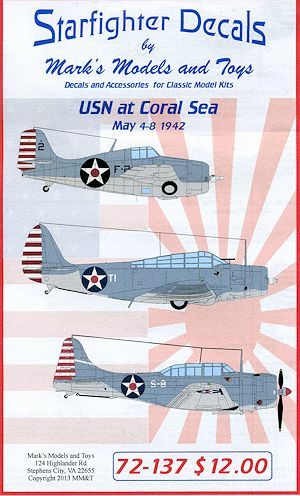 In all, a very good sheet that is a real boon to USN 1/72 modelers. I do hope we will see more of this series as I think it is a great idea. Thanks to www.starfighter-decals.com for the review sample.